The Phipps Conservatory and Botanical Gardens constructed its new 24,350 square-foot Center for Sustainable Landscapes (CSL) using Living Building Challenge design criteria, which brings together a broad array of eco-technologies that operate in concert with state-of-the-art energy-saving technologies. 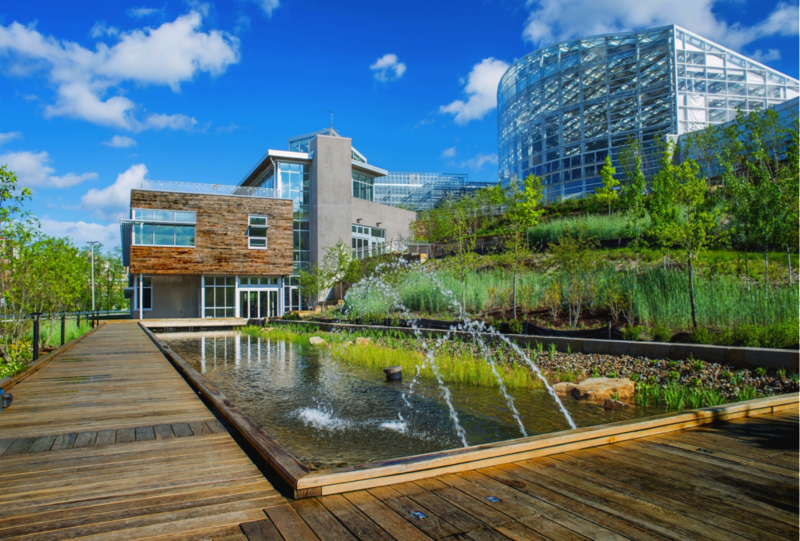 In addition to being a Living Building, the CSL has earned LEED Platinum, Four Stars Sustainable SITES Initiative, and WELL Building Platinum designations. CSL facility houses sustainability research and science education programs, and serves as a key part of the public garden’s immersive experience, which attracts over 400,000 guests each year. In producing all of its own renewable energy, and treating and reusing all water captured on site, the CSL demonstrates that people, plants, health, planet and beauty are all interconnected, and that sustainability is the key to ensuring these connections are harmonious for future generations. WPPSEF provided $150,000 to co-fund CSL’s geothermal heating & cooling system, a desiccant dehumidification system, an energy recovery system, solar PV, an Epiphany solar water system, and a real-time energy dashboard. The CSL opened in December 2012.